The Deferred Sales Trust is designed so that the proceeds of the sale of a business, real property or highly appreciated collectables can achieve tax deferred status. 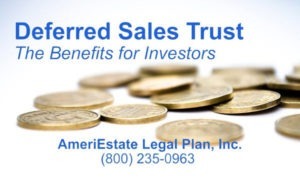 The original seller of the appreciated asset first sells the asset to the Trustee of the Trust, who then “re-sells” the property to the intended buyer. The transaction is effectively completed in what could be termed a double escrow. The proceeds are invested in a manner consistent with the Trustee’s obligation to pay the Seller his or her principal back with interest, over a specified time period. This arrangement is known as an installment sale. The seller only reports and pays taxes as he or she actually receives payments of interest and/or principal. The total payments, or distributions the seller receives are broken down for tax purposes into ordinary income, capital gains, depreciation recapture and (tax free) return of original basis, thus achieving a lower overall tax rate on the entire annual distributable amount. The core benefit of the DST is that it allows the seller to generate additional personal income on dollars that would otherwise have been paid in federal and state income taxes in the year of sale. Typically, Trust assets are invested in traditional investment classes such as stocks, bonds, managed portfolios, mutual funds, EFT’s, REIT’s, insurance products, etc. The investment portfolio, as stated above, is usually structured to provide the income stream the seller is seeking while preserving the underlying principal for full repayment during the term specified by the seller. The underlying payout rate and the projected rate of return of the portfolio are also influenced by the sellers individual risk tolerance related to invested assets. When investing assets to achieve the seller’s desired payout, the Trustee typically employs the services of a pre-screened, vetted and approved Registered Investment Advisor. His or her job is to make recommendations to the Trustee and the seller as to how assets should be deployed (invested) to allow the Trustee to fulfill the terms of the installment note. Since the assets ultimately belong to the seller, the seller has tremendous influence over how their proceeds will be invested, including veto power over recommended investment options that they are not comfortable with. Using the DST means that your ‘collateral’ is much more diversified and as liquid as needed. Having an independent Trustee is vital to ensuring IRS compliant tax deferred status of the DST, however, you should be concerned about the Trustees ability to divert your funds for their own purposes. Trustees are human too, regardless of their history and track record. Therefore, reasonable protections should be put in place to protect the integrity of the Trust and safeguard the client’s assets. In this regard, every DST is protected by a DACA Agreement which stands for ‘Deposit Account Control Agreement’. For purposes of DACA, we use a 3rd party bank to serve as a sort of escrow. Before the DST is funded, the Trustee will execute an installment agreement with the seller specifying the payments to be made to the seller on a periodic basis. Only those distributions agreed to by both the seller and trustee in writing, will be made, which typically includes only the seller distributions and the payment of trustee fees. The Trustee has no power to make any other payments or transfer of assets from the Trust account unless the seller co-signs the authorization. Example: If you wish the Trustee to transfer funds to an LLC in order to purchase property, both Trustee and Seller must sign an authorization to do so. (2) If seller requests a change in the terms of the note to either accelerate or extend the note which affects payments to him or her, both trustee and seller must sign an authorization. The Trustee will not unreasonably refrain from a request by the seller. In short, the Trustee does NOT have the power to pay or distribute funds that are not agreed to in writing by both seller and Trustee at any time, for any reason. In this regard, your funds are protected from any threat of embezzlement. Alternative Investments as a component of portfolio management. It is not uncommon for sellers to inquire about alternative investment options to be included in the overall investment portfolio. To give a few examples, some sellers have a desire to add individual real estate holdings, hard money or 2nd Trust Deed Notes, Private Equity, Hedge Funds, Commodities or even derivative contacts to the portfolio. Sometimes sellers want to invest in a new or existing private business… for example, one client owned a chain of restaurants he sold using the DST so he could retire without the stress of managing this very time intensive business. Instead, his idea of retirement was to operate a small taco shop in his community where he was well known and frequently visited by his friends and neighbors. In each of these cases, the seller was able to use DST funds to fund or invest in these ventures, in effect using funds that would otherwise have been paid in federal and state taxes to seek higher returns; be involved in direct management of an alternative investment; or to create a hobby or lifestyle business.